What Would You Like To See Happen In Your Music Career In 2017 That You Didn’t In 2016? We all have dreams and aspirations. Let me share with you a few of my own. Launch a physical magazine. The digital magazine is already available, but I would love to make physical versions too. Start a record label. I had an independent record label in the past, but I’d like to take it to the next level. I’m already a producer and a decent engineer, and I’m also developing my business sense, so it’s mostly about timing and resources at this point. Build a home studio. I used to have a home studio when I still had my home, but I’m looking to build a much nicer, more fully fleshed out studio. Open a music venue. One where there’s no pressure to earn a certain amount of money every day to keep it open. Just an amazing tour stop for musicians in every genre. These are some of the “big picture” dreams I have for my business. Am I anywhere near accomplishing these things? I don’t know, but what I do know is that I’m putting in the work to get there. So, what would you like to see happen in your music career? Do you have any unfinished business from 2016? Do you feel like you’re grinding your wheels and not getting anywhere? Are you already thriving in your career, thinking about what your next steps are going to be? 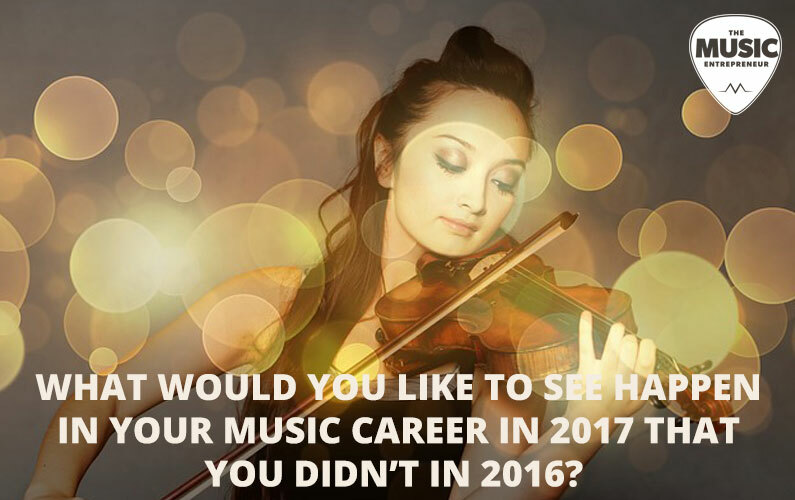 What would you like to see happen in your music career in 2017? What are you doing to make this your year? Please leave your answer in the comments section. I look forward to hearing about your big goals and how you’re planning to move forward this year.